Buckcherry have just released their sixth studio release entitled Confessions. The band catapulted from nowhere in 1999 with their self titled release which ended up going gold based off strong songs “Lit Up” and “For The Movies”. The band released Time Bomb to less success which led to the band going on hiatus. When singer Josh Todd and guitarist Keith Nelson reconvened in 2005 with new members Stevie D (guitars), Jimmy Ashcraft (bass) and Xavier Muriel (drums), the lineup has remained the same ever since. Confessions works well as a cohesive theme where the seven deadly sins are all represented here as song titles. “Lust”, “Gluttony”, “Greed”, “Sloth”, “Wrath”, “Envy” and “Pride” all go deep making this album Buckcherry’s most in depth record. The songs trace back to Todd’s childhood as he wrestles with the sins in a unique way. The album clearly is the bands strongest effort since their 2006 comeback 15. The first single “Gluttony” kicks the album off in rip roaring fashion. 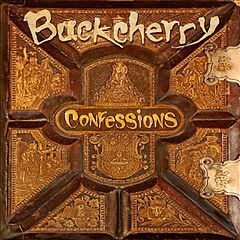 Fans of Buckcherry will certainly have difficulty choosing their favorite song off Confessions mainly because they all have memorable hooks and melodies such as standout tracks like “Pride”, “Sloth” and “The Truth”. The album closes out with “Dreamin’ Of You”, a song of hope and inspiration. The mellow song features mainly acoustic guitar and Todd’s vocals as the lyrics “Believe in yourself and stand up tall, It’s our time to shine, it’s our time” deliver that message of hope. After listening to this album Buckcherry is definitely standing tall and shining brightly.